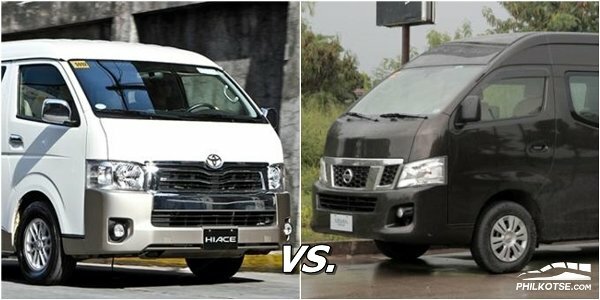 Nissan NV350 vs Toyota Hiace: Which is the better van for Filipinos? See which is the better commuter van between the Nissan NV350 vs Toyota Hiace in the Philippines. In this Auto brawl 101: Nissan NV350 vs Toyota Hiace spec battle by Philkotse.com will pit these top commercial vehicle options against each other. These are the top options when it comes to commuter vans that are the best ones to get in the market now. Although there are alternatives like Foton, it is not as well appointed, compared to these two top choices. These options are one of the roomiest automobiles that one can get, and they make long trips better. Toyota and Nissan have differing philosophies when it comes to commuter vans, and this is reflected in the different layouts of each. One thing though is that Toyota has upped its game and it is reflected in their design. The two car manufacturers of Japan still have the box-design, but made some changes to make it sleeker than previous versions. The Hiace seems to dominate, but the Urvan still have some tricks in its sleeve that evens it out. Before the specs bang away at each other, let's introduce the commuter vans that will be featured. Nothing is ever equal and expect it to be a close call for some specs! One of the better options that have been around a long time and one of the go-to choices for many families. 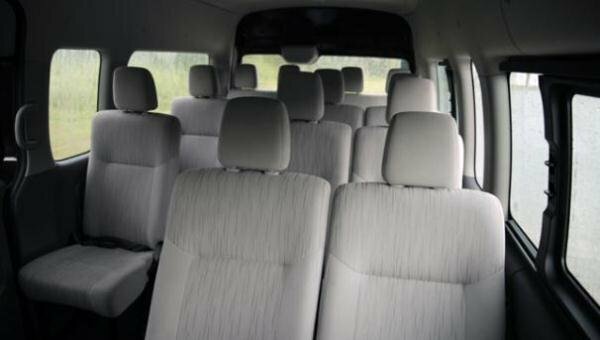 Many large families opt for this commuter van because of its spaciousness, and it uses cheaper diesel. With the Grandia variant, it became apparent that commuter vans aren't barebacked options anymore. The Nissan Urvan came a bit late to the commuter van market but quickly made headway. Next, to the Hiace this became a favorite for FX operators because it is spacious as well. One plus of the Urvan is the AC that as one of the AC systems that are very cold! Nissan seems to be the second-stringer but is a better second option and much cheaper. 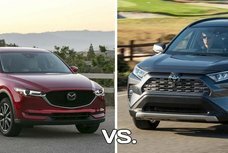 Before wading into this head-to-head comparison, it would be better to have a look at our comprehensive reviews of these two models for a broad understanding about them. Any commuter van needs to be big and have more than enough room for up to ten people. Look over the dimension, and you notice its substantial when compared to SUVs as well. 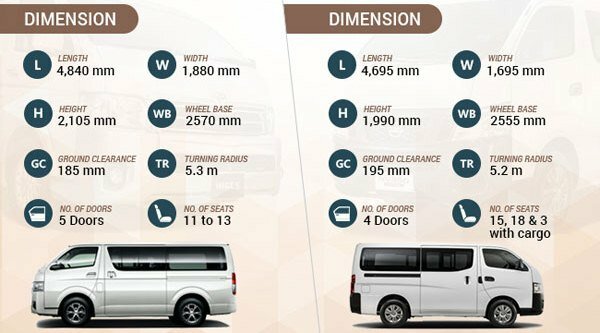 The Hiace is bigger over-all in all dimensions of length, width, and height that makes it roomier by +415 millimeters. This is significant and provides more room than the Urvan for more room inside. Because of this and that makes it the biggest commuter van but with a “nice” price. Not a slouch either is the Urvan because it has a better front and rear cabin than simple FX passenger options. The Urvan loses by -415 millimeters in terms of space but can seat about fifteen inside. A second stringer but still a better option than the Foton variant which ranks third. In this car comparison review dimensions count because it means that it’s a big commuter van. The Hiace wins out by a large +415 millimeters, but the Urvan still can seat five more, due to the seat layout. This NV350 vs Hiace battle is not complete; unless the main battle of the better and most efficient specs fought out. One thing to note; is that size is important, but it must have the numbers to back it up. The last thing anybody wants is a lumbering brick of a commuter van. Specification wise, the Hiace has good numbers that are better than the Urvan. Although it shares some similar suspension and brake equipment with some slight variations. Only if the rear suspension was a better than a rigid axle, but its far better than rigid leaf springs of the Urvan. An AT transmission is an option, and that’s quite good compared to MT transmission of the Urvan. 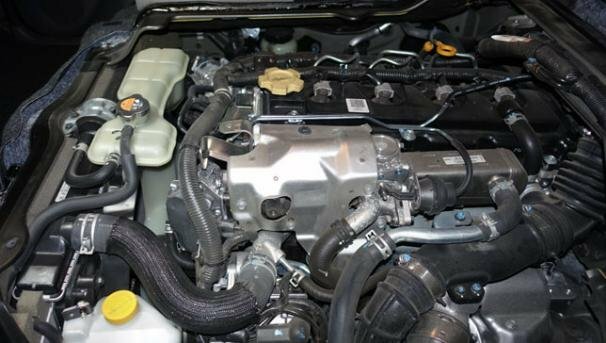 The best goodie; is the 3.0 Liter with similar displacement which is greater than the Urvan's. One spec that the Hiace loses out is in torque but is better at horsepower compared to the Urvan. Overall, the Hiace wins out in performance but only by a hair! 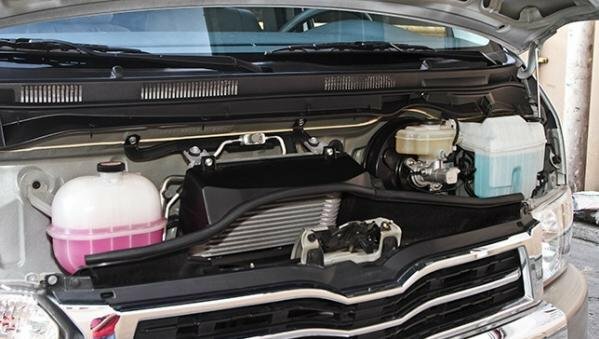 The specs of the Urvan is better only in the number of passengers and its torque. 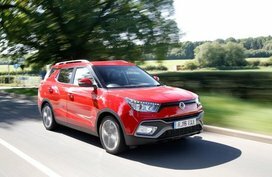 It's displacement and engine stats which could have made it a draw but did not pan out. Lacking AT transmission and its tires need a size upgrade soon is an issue. Low numbers may not be a decisive factor, but performance does demand bigger numbers. This is a big box that can haul fifteen people courtesy of its acceptable specifications. 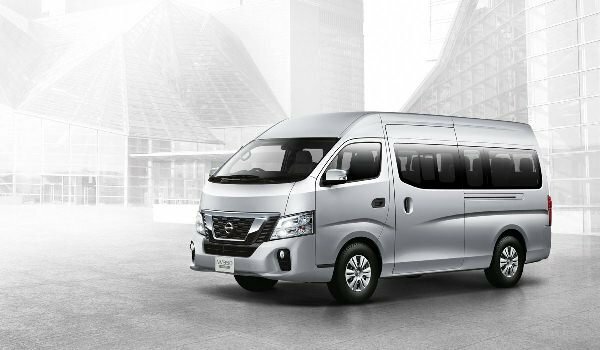 Nissan NV350: A powerful public utility van in the Philippines! 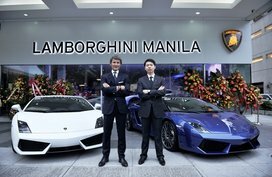 The spec numbers were won by the Hiace only by only a small margin. In this comparison, performance is tricky, and the numbers will make a difference. This round goes to the Hiace by a smidge or two but lets' move on. Among safety features that should be standard like ABS, EBD, and BA because most motor vehicles have it. The Hiace has ABS; unlike the Urvan which has a Load Sensing Valve. Nothing special about the Hiace Grandia which has ABS installed but lacks EBD and BA. This is odd for the price it costs when it should have a better layout. Additional features like 3rd brake light and airbags barely cut it in the safety department. The Urvan does not fare any better than the Hiace, but it has a Load Sensing Valve which adjusts the brakes. It is a bit on the ill-equipped side; it doesn’t have ABS, EBD, and BA that is regretful. Basically, a simple layout but lacks any serious features. In this section, it only shows how both options can be improved a lot. Safety features need a desperate upgrade for both, but the basic safeties will do for now, but it can be better! Performance and safety mean nothing; should it lack a nice riding cabin. 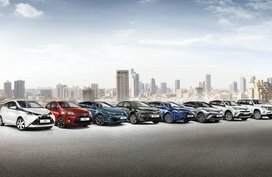 The options have the standard comfort, with interior features but one does better! Adding a simple feature or two can make big difference, and that is evident why one won out handily. The Toyota Hiace is obviously a roomy ride. This option won because it has two features that make a great difference over the Urvan. The use of leather for seat fabric, and two captain seats that is great for luxury and comfort. It can be argued that the standard options count, but both have the same ones. This negates the argument; use of leather and the addition of captain seats will make the price more bearable. 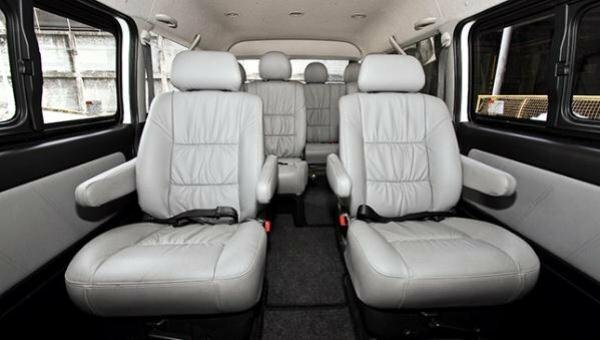 The Urvan has all the standard features, but leather seats and captain seats are better. The Hiace has more luxurious accents; if an ordinary commuter van is okay then get this. Better be ridden by non-discriminating commuters, but picky buyers may dodge the Urvan outright. Picky car buyers love small luxurious touches but for many this would do. If only the Urvan upped its game, but the Hiace won out again. It won’t count if any option in our comparison review doesn’t have the looks or the equipment outside for a better drive. Looks do count, especially if it has a backing cam and anything that helps the driver and the passengers. Once again, the Hiace rocks it and does better than the Urvan by a mile. It has a reverse cam that the Urvan lacks but it has a rear sensor that helps. The Hiace wins by smidge again, and the Urvan is trailing behind. It lacks a rear cam that could have tied it up, but it doesn’t. Another chance lost for the Urvan to be preferred, but no dice again. Trumped again by a single feature, which could have been added to make it worth the money. The Urvan got clobbered in the specs again. This shows how options can go wrong in Auto brawl 101: Nissan NV350 vs Toyota Hiace and how a minor detail changes everything. 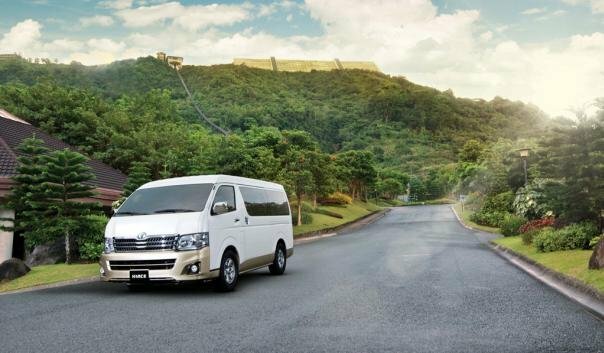 Both the Nissan Urvan and Toyota Hiace are great vans for Filipino families, but the better option is the Toyota Hiace Grandia; it outperformed the Urvan Premium thoroughly. Maybe the emphasis of the Urvan is an affordable people commuter, but the Foton commuter van is a similar option that is much cheaper. Between a just price-right van and slightly higher priced van, the one with extras will win! It’s a win for the Hiae with goodies to match the price! Nissan NV350 vs Hiace​: What’s the better commuter van? 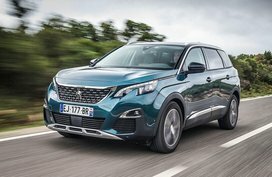 Eventually, do not forget to visit Philkotse.com for more in-depth car reviews by experienced experts and the latest updates in automotive industry.